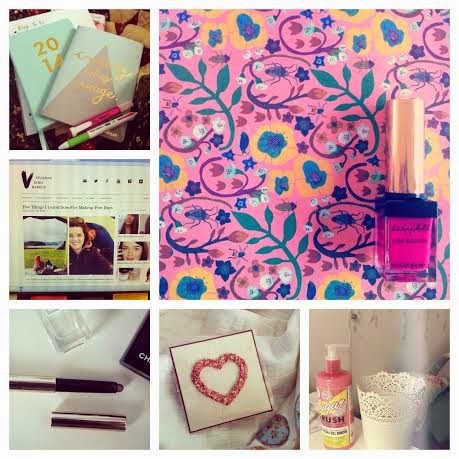 The Week in Instagrams @nanawintour: *A little bit of blog planning on Wednesday. I made up a nice 'lil schedule for July and also started working on a swap I'm doing with Tamira which is all very exciting! *Reading blogs on the sly. Shh.... *#annamademedoit. *A gorgeous heart card I picked up to send in the post. If you're in New Zealand you can find these at Trade Aid. *Hannah and I had another sleepover on the weekend and she bought me back these gems from Sydney. Thanks Hannah! x *I love blog sales, this was a score from Tamira's Instagram. I'm not sure if these YSL 'Kiss and Blush' products are out here yet but you can find them online here. Must-Watch of the Week Month: A few YouTubers have been vlogging every day this month but it's Zoe's that I have been enjoying the most. Many of you probably already watch her videos but her vlogs are great. If you're like me and are a bit obsessed with all things British then you will love them. Brighton looks so gorgeous! Not to mention Zoe is awesome too. You get the idea, go watch them if they float your boat. Product of the Week: Maybelline Colour Elixir in Mauve Mystique*. These products (out soon) are more of an affordable alternative to the Dior Fluid Sticks. They apply creamy and stay quite glossy on the lips. The best part is they don't feel sticky at all and they are pretty long wearing. Mauve Mystique reminds me a bit of Mac's Syrup in liquid lipstick form. I have one of the pink shades of these too. I can't wait until the rest are out because there's some gorgeous colours in the lineup. Must-Read of the Week: Nicole's post on the controversy surrounding high end makeup. I don't get a lot of flack for featuring high end products on my blog, but I know that's not for everyone so I do try to mix things up every now and again. I do agree with Nicole though that some products just perform better at a higher price and in some cases you do get what you pay for. I steer clear of drugstore foundations for instance because the colours usually tend to be off for me and will often drive my skin nuts. It's an interesting read and offers insights that I can relate to. Added to the Wishlist: Fresh Sugar Lip Serum Advanced Therapy, a new product available from Sephora that launches in July. This product sounds interesting, perhaps it'll be a rival for this. Taking care of your lips, especially in Winter is such an important step. The Lip Serum promises to "firm and reduce fine lines around the lip area using flower and fruit extracts." I am intrigued..
No problem S!! I had such a blast at our sleepover - I can't wait to move closer to you so we can see each other more often! Sleepovers every weekend haha! I have been loving Zoe's vlogs too. Watching them is the perfect way to chill out after a long day at work and a long evening blogging.